Lack of transparency in the Executive has led to many problems in the country, said former chief justice Sarath N. Silva yesterday. 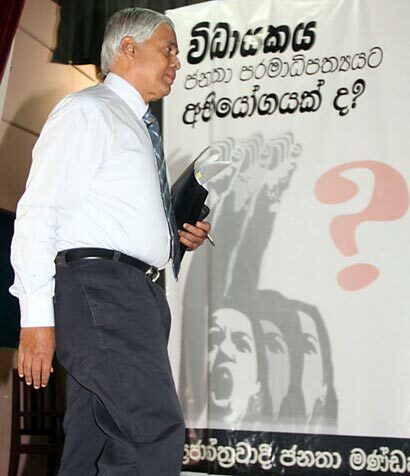 Addressing a seminar entitled, “Is the Executive, a Challenge to the People’s Sovereignty?” in Colombo, the former chief justice alleged that there was no openness or transparency in the Executive. “Though the activities of the legislature and the judiciary are accessible to the public, the Executive acts in a secret manner,” he said.The former chief justice said that the lack of the right to access public information had strengthened the arm of the Executive. He maintained that the hedging agreement that cost the country millions of dollars, the import and distribution of low quality petrol by the CPC and the present financial crisis in the CEB could have been avoided if the Executive had acted in a responsible and transparent manner. “Though the Supreme Court bench headed by me delivered an order to reduce the price of a litre of petrol to Rs.100, the Cabinet headed by the President decided to reject the order,” he said. He further alleged that, though the Supreme Court had given an order to stop payments to several commercial banks over the hedging agreement, the government had ignored the Court order and paved the way for the present financial crisis. The former chief justice said that the sovereignty of the people was inalienable. He said that the people had exercised their power to chase away corrupt and irresponsible rulers on several occasions in the past. What can I do when my vote has no power in this country?